In this article, http://dld.bz/d6usx, we talked about hammock tasks. The question came up about something that isn’t really a hammock task, but is a task that depends upon another task’s duration. Let me explain a bit more about what the question was about. This client had a situation where a certain task’s overall duration is based on the duration of a different task in the schedule. However, the two tasks are not in a predecessor/successor relationship. If the duration of the first task changed, the other task’s duration also needed to change. But, managing this manually isn’t realistic since the schedule is alive and can move weekly and this would be tough for the Project Manager to keep up with both durations all of the time (plus, manually moving durations and possibly moving dates could set unintended constraints). The solution is fairly easy and similar to the hammock task. In this example, I have seven tasks. The tasks are all Fixed Duration, automatically scheduled and are all linked in a Finish-to-Start relationship. The First Task (Task ID 1) will be the one that will control the duration of “Depending on First Task” task (Task ID 5). At the beginning of the schedule, all tasks are a nice clean 5 days. The way to set up Task ID 5 to be dependent upon Task ID 1 is to copy the duration from Task ID 1. 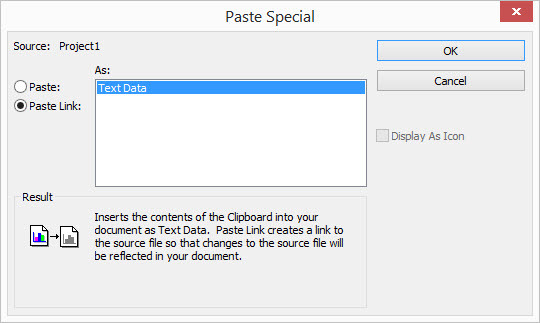 And, select the Paste Link option and select OK.
At first, it appears that nothing happened. But, if you look closely, you will see a tiny indicator in the bottom right corner of the duration field. 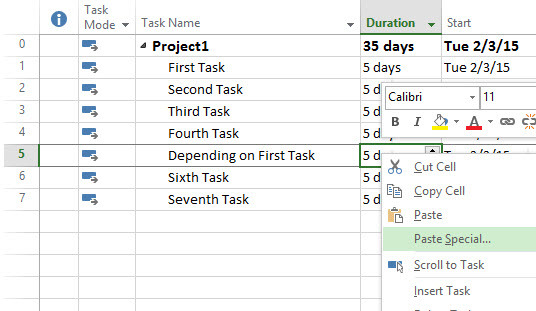 Now, whenever the duration of the original task (Task ID 1) changes, the duration of the dependent task (Task ID 5) will automatically change to match. In this example, I changed the original task’s duration from 5 days to 12.